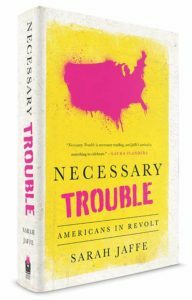 Interviews for Resistance, Necessary Trouble healthcare, interviews, resistance Leave a Comment on “The time for this issue has come.” Keith Ellison on Medicare for All and more. Children’s healthcare was a bargaining chip in the latest showdown in Congress, but with the government shutdown over for now, Republicans are planning more healthcare cuts. Much of this will happen on the state level, as the Trump administration has given states the green light to impose restrictions on Medicaid that include work requirements–the same kind of work requirements that helped destroy the program formerly known to most people as “welfare.” Rebecca Vallas of the Center for American Progress joins me to talk about the unending attacks on healthcare, why calling things “welfare reform” is wrong, and how to challenge the attacks on these popular safety net programs. I think the first thing that we need to do is learn from 2017, where we actually saw Medicaid’s overwhelming popularity across party lines be what stopped Republicans from being able to unilaterally repeal the Affordable Care Act and dismantle our healthcare system. It was Medicaid that saved the ACA. I think the lesson to learn from that is, for starters, Medicaid and nutrition assistance and affordable housing and more, all these programs that help families stay afloat when they fall on hard times or when wages aren’t enough, they are incredibly popular programs. Rather than talking in the Republican talking point terms about these programs being for “the poor” or sort of following their lead that this is about some other, we need to be talking about and thinking about these programs as for all of us when we need them when our wages aren’t enough, when we lose a job through no fault of our own, when we end up needing to care for a sick loved one or when we get sick ourselves. The more that people think and talk in “us” terms as opposed in pity or charity terms as though it is about some group of other people that they are protecting these programs for, the more that we will get to a place where not just Republicans in Congress—I should say just policy makers, generally–understand this, but also that the media starts to understand that these programs are there for all of us and these fights are ones that matter to the American people across the board. I think that is incredibly important to hear and to think about because so often and for many, many years progressive folks who have been well-intentioned in talking about these issues have really done it in terms of “protecting the least among us” or “the most vulnerable,” all of which really reinforces that myth that somehow the poor are “them” rather than us. Brigid Flaherty moved home to rural North Carolina after the election of Donald Trump to put her years of organizing experience to work “down home,” bringing together a multiracial organization of working-class people to build power in their communities. A year later, Down Home North Carolina has organizers and members in several counties and campaigns on national, regional and local issues, from healthcare to racial justice to energy bills. Flaherty joins me with member Kischa Peña and organizer Juan Miranda to talk about Down Home’s work in the last year and what’s coming up for them in 2018. BF: When we were looking at the political makeup of North Carolina and what had happened since 2010 and the far-right takeover of the state and then moving into 2016 and watching that happen at the federal level, it felt like the best offense that we were going to have was to make sure that we were building strong local leadership in places in North Carolina that weren’t necessarily the places that had a lot of infrastructure. For us, this felt like a long-term project that needed to happen in order to make sure that working people got what they deserved, were able to build their leadership, and flex their muscle so that we could really be making winds that could change people’s lives in the years to come. We said in November that we were going to start Down Home and then actually got off the ground in June this year. We have been around for about six months. Originally, it started out just Todd and I doing the organizing. I moved back to the mountains where my mother lives and I was actually living with her for the first few months and Todd was organizing in Alamance in the center part of the state. We just got out on the doors using a listening survey. We went with three broad questions, basically, which were: What are the issues that matter most to you and your family? Who or what is responsible for those issues? What are your solutions? I think one of the things we really felt we learned from the 2016 election is that a lot of working people don’t feel listened to. The parties have never contacted them. It felt like a lot of people were speaking for them and yet they were like, “Y’all have never come to our door. You have never sat in our living room.” Again, we have only been around for six months. We basically used the first four and a half/five months to just listen and use that survey to really be able to develop the leaders and develop the issues that would be the things that we were going to fight on as Down Home. That is really how we got started. Maine Senator Susan Collins was one of three votes to stop ACA repeal. But last week, after getting empty promises that are already being walked back, she voted for a tax bill that include big healthcare cuts, and her constituents are not pleased. The Maine People’s Alliance and others have been protesting since the vote, and plan to continue challenging Collins to stand with her state when it comes time to vote on a final bill. As you may remember, Susan Collins, upon returning to Maine after voting against the Republican healthcare repeal, got applauded at the airport. There were several scenes of people on the street thanking her for her vote. She did not have the same reaction in Maine, actually she stayed in D.C. and did the Sunday shows, but in Maine people were protesting up and down the state and they are continuing to do so all this week. Yesterday in Bangor dozens of people were outside her office and five very brave souls went inside and refused to leave until she talked to them about her vote, and she did not and they got arrested and carted out in a police van. So things are definitely escalating here, I think people believe that she’s not listening to them, that she’s doing real damage to the state, that she’s been lying about her votes and about the policy and that they’re not going to take it anymore. Last weekend, in Washington, D.C. the Juggalos—fans of the band Insane Clown Posse and their record label—marched against their criminalization. In 2011 the FBI decided to classify the Juggalos as a “hybrid gang,” meaning that their love for a particular musical act marked them as threats. 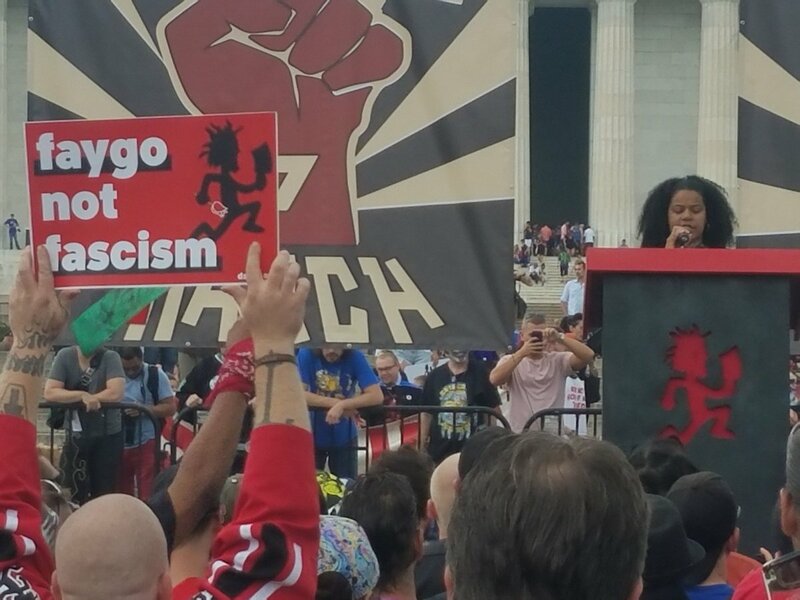 Juggalos are often written off by the rest of society, but to some leftist political organizations, the march was an opportunity to demonstrate solidarity and build connections with a group of people politicized by their outcast treatment. Allison Hrabar of Metro DC Democratic Socialists of America was part of a solidarity delegation to the Juggalo march, and also shares the latest organizing against the latest version of zombie Trumpcare. We were excited about it as soon as we heard about it. The idea of the Juggalos marching on Washington is an exciting idea. I think everyone on the internet can relate to that. When we heard about the actual issues, we knew it was something we ideologically supported. As socialists, we don’t like state repression. We don’t like the abuses that law enforcement inflicts on our citizens. At our recent DSA convention in August, actually, we passed a resolution about dismantling the police state and abolishing prisons. So this falls in line with our party assessed ideas. Also, we want to build a movement that actually reflects what the nation looks like. DCDSA tends to lean white, it tends to lean professional. So the idea of being able to reach out to a group of working class people, reaching out to people who have actually been affected by police. Not just people who care about the issue, but people who can talk about how this has really affected their lives, was really important to us.